I learned of the Microsoft DigiGirlz Camp several years ago. It didn’t occur to me at that time that I would ever be a part of the camp experience. It was no secret that I was outside of the target age range to be a camp attendee and my daughter outgrew her eligibility for registration for the camp many years ago. So, I never explored the mission or methods of the DigiGirlz Camp before this year. by the instructions. Another time I bought some sort of wooden sticks for her and a high school friend to use when they entered a bridge building competition. Their team name was “The Ballahs” which was pronounced ball-ahs which is slang for ballers, if you still missed it. I’m not sure the girls had any idea what a “keynote” address even meant and it was my guess that if a “keynote” anything was an option outside of this event they wouldn’t have chosen to attend. “Keynote” felt overused. It reminded me of conferences I have attended that have a number of keynote addresses and speakers. I guess the word was supposed to make me standout as a special person whose message deserved to be heard. The internal challenge for me was that my voice and words only would have meaning if the girls wanted to listen and if the girls gave me permission to speak. Minimizing my role by thinking of my time with them as one in service to uplift and empower gave the power back to the campers (or at least it did in my head.) Although the itinerary said “Keynote” I aimed to prevent myself from being caught up in the “Keynote” status. I envisioned the word as an amazing platform upon which to stand and deliver words of affirmation, historical framework for women in science, and five things the girls could remember that would help them be successful in life. This platform enabled my message to project around the circular room and each of the girls to see my excitement about their potential to achieve and overcome on their journey to attain their dreams. Gratitude and humility filled my space as I realized the opportunity that had been gifted to me. Most often my student presentations are geared toward college students ages seventeen to twenty-three. I hoped the younger campers would get my humor and comedic timing. They did. I also wondered if they would recognize images of a typewriter, an outhouse, and pay phones. They did. In contrast to the dated technology, I presented futuristic devices used in the movie Black Panther that were invented by Princess Shuri. I wondered if they would enjoy the hearing Princess Shuri introduce her brother to her new inventions. They did. I wondered if they would care to let me read a book to them about the life the first Black female aviator in the world, Bessie Coleman. Would they like being read to like the elementary school children I’ve read to in the past. They did. Finally, I wondered if they would enjoy making paper airplanes as takeaways and reminders of the need to dream. They did! Grace reminded me that it is smart to only communicate or connect with people online who you have actually met. Young people enjoy hearing stories about your youth. Young people love grown folks who are transparent and not afraid to reveal their own imperfections. Young people like it when grown people give them a chance to speak out loud about their dreams without judging them or their dreams. Young people enjoy laughter as much as I do. Build a village of encouragers! Be alright being the first to do something cool! 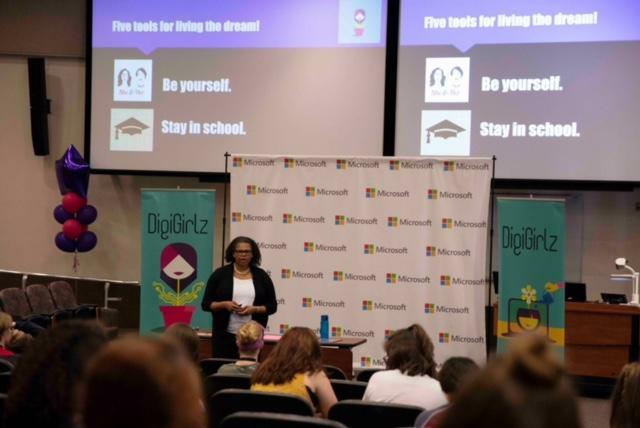 Preparation for the DigiGirlz Camp stretched me to organize my thoughts and my presentation in a way that would be Straightforward, Timely, Educational, Age-appropriate, and Motivational. Showing up for anything whether you are the presenter or the attendee is a risk. I am so thankful that I said yes to the opportunity and that the girls took the risk of showing up for the camp. I am not certain that all of the girls will choose a career in technology, but I have no doubt that their two day camp experience will pay dividends by boosting their confidence, broadening their exposure to the diversity of opportunities in the field, and expanding their network of supportive adult professionals who can guide them as they make choices about their studies and careers. DigiGirlz Rock!